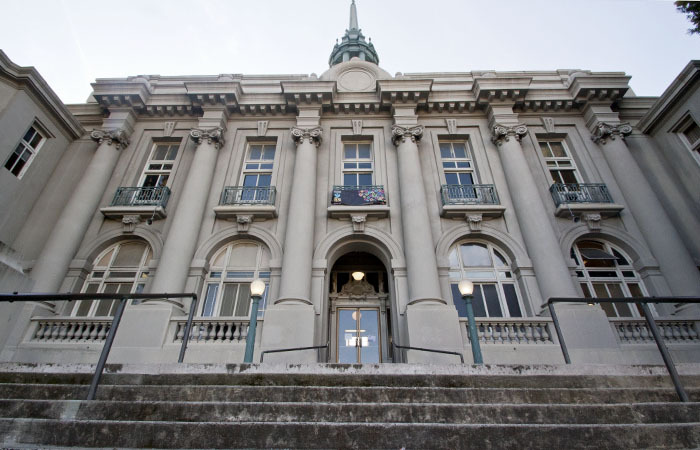 Old City Hall, home to Berkeley Unified School District's administrative offices, is seismically unfit and its future is in limbo. Excitement and apprehension filled the air this morning as Berkeley voters began to trickle into polling locations scattered throughout the city to cast their ballots in the midterm elections. Despite anticipation surrounding close races such as Jovanka Beckles’ and Buffy Wicks’ bid for the California State Assembly District 15 seat, poll worker Samantha Kerns said it has been a slow morning at the Martin Luther King Jr. Student Union polling location. Yet, as the day progressed, lines grew longer. By 12:30 p.m., so many voters had arrived at the student union location that the booths inside did not suffice. Outside the room with booths, a number of students settled cross-legged on the floor or lay on their stomachs on the carpet to pore over their ballots. “It is powerful to see so many young people come to the polls,” said Mary Kate Becker, a poll worker at the student union location. Although many college students vote in their home districts, those filling out ballots in person can find more than 50 polling locations throughout the city. Some are located in campus facilities, such as the student union and Unit 3 polling locations. When voters arrive at their designated polling location, they receive a multipage ballot and are pointed toward a booth for privacy. It can take voters awhile to fill in all their choices, working their way through the many ballot measures and the candidates running for positions in many different areas ranging from the U.S. Senate to the state Board of Equalization. Once completed, poll workers — often fluent in multiple languages — help voters scan their ballots. Polling stations also stock freely available voter guides in various languages for those who want more information about the items on the ballot. Even voters registered out of state can come to Berkeley polling stations to drop off their ballots. Shane Derrick, an absentee voter from Florida who submitted his ballot at the Old City Hall, said he feels “a lot more excited than usual” about this election. Others echoed this sense of the election’s importance. At the Unit 3 location, campus student Clevian Hsia was one of several students who expressed convictions that every vote matters this cycle. “What I’m most excited about is … finally being able to contribute and taking advantage of our natural right to vote,” said campus student and first-time voter Hadar Gamliel. Polling locations will be open until 8 p.m. tonight. Staff writers Thao Nguyen, Mallika Seshadri and Ronit Sholkoff also contributed to this report. Contact Danielle Kaye and Sophia Brown-Heidenreich at newsdesk@dailycal.org.